In a surprise move, DML has now released a nice fresh set of four Commonwealth figures from what appears to be the “Sitzkreig” or “Phony War” period of the BEF deployment to France in 1940. It consists of an officer in a raincoat (NOT trenchcoat) and three “squaddies” in greatcoats manning a Vickers .303 water-cooled machine gun. The figures follow the DML format – six parts consisting of head, torso, arms and legs – but as all are in winter garb their coat skirts are separate parts. Each skirt consists of three or four parts, all with nicely thinned edges, and all designed to simulate the positions shown on the box art. The officer is kneeling and pointing with a stick, the gunner sits wrapped around the rear trail of the Vickers, and the “other numbers” are prone, one feeding the gun and the other with rifle at the ready to provide cover. The Vickers gun is of the “smooth” jacketed variety but comes with expansion/feed tank (the hose must be bent to fit by the modeler as it is molded integral with the tank), three ammo cans, a belt of around 50 rounds, and the lock and brace. It has the recoil booster in place but as it is in the middle of the sprue does not come with a clean molded bore. The carrying straps and handles are provided as etched brass components, but they will need annealing to be twisted to shape as shown. A section of what appears to be spare hose (W9) is also provided. This kit also uses the disappointing Photoshop style artwork which has begun to appear on other DML sets of late. 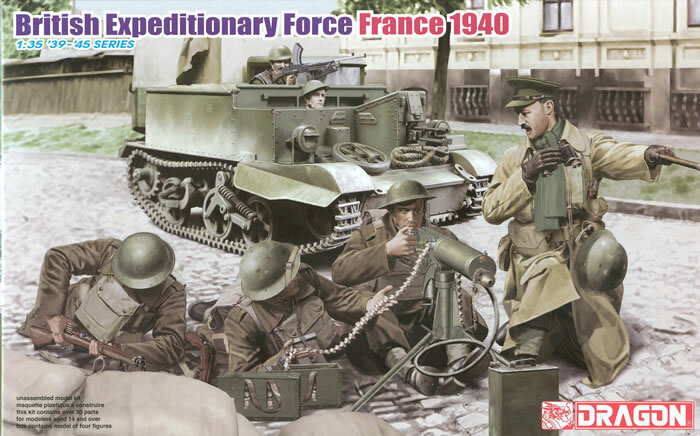 It shows a Universal (“Bren”) Carrier with two soldiers covering the deployed team and appears to combine reworked shots from WWII with reenactors. The back of the box is little help in finishing them (they assume you use GSI Creos Mr Color!) nor is the washed-out color of the figures any help. DML really needs to spend more time on supporting their products. Overall this is a great new set, but due to the early war winter setting will be of little use other than very early in France, Norway, or some of the operations in Greece.